Upstream/Reservoir is an open systems backup and recovery tool. The original FDR/Upstream tool used a mainframe as the central management server, but many sites do not have a mainframe, and some of those that do, do not like the idea of open systems data being managed from a mainframe. Upstream Reservoir caters for these customers by using a UNIX, Windows or Linux management server. Upstream Reservoir includes policy based incremental backup, logical file restore, job scheduling and a Java-based director for central administration. UPSTREAM Reservoir also provides archival storage management functions for a wide variety of systems, databases and enterprise servers. The UPSTREAM Reservoir backup server can reside on x86 Linux, Unix or Windows supported servers, and supported clients include several versions of Windows, Netware, Linux and Unix. See the InnovationDP website for a full, current list. 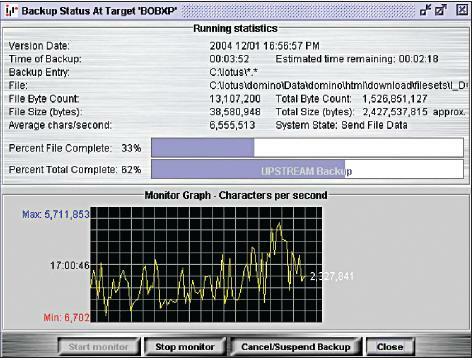 UPSTREAM supports backup to disk or tape. The backup devices can be a single tape drive, robotic tape library, enterprise silo, or disk arrays. Disk backups can then be migrated or vaulted to tape for offsite recovery. UPSTREAM Reservoir provides excellent tape utilization by stacking multiple systems or database data on high capacity tapes drives. Multiple backups can be written to a single tape, either by combining full and incremental backups for individual clients, or by using Profile Sets, which will consolidate backups from a number of different servers onto a single tape. The 'director' interface is a Java based browser that provides web access to the Upstream Reservoir from anywhere on the Network. It provides a central management and reporting interface and can be used to schedule regular or ah-hoc backups and restores. Backup jobs can be scheduled from the 'dispatcher', or from an external scheduling tool. The dispatcher allows daily, weekly, monthly and other combinations of scheduling cycles. It is possible to create a full backup by merging a previous full backup with subsequent incrementals by using the Intelligent Full Merge Backup facility. This means that only one first-time full backup is required then all further backups are incrementals. This Full Merge Backups effectively virtualizes a full backup by requiring only changed data from the client, while using previous backups for the remaining unchanged data. All it requires is a directory listing at the point in time when the merge is created. 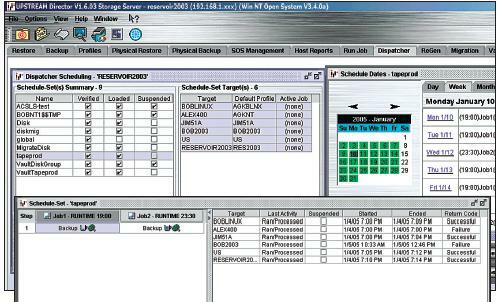 Backup types include Logical, Differential and Incremental and are selected using a GUI on the client. UPSTREAM Reservoir supports Pre- and Post-Processing Options and also local and remote D2D Backup. It has open file agent support, and problem files can be globally excluded. UPSTREAM Reservoir also supports non disruptive online database backups, with agents for DB2 Universal Server, Lotus Notes, SQL Server, Oracle, MS Exchange, SAP, Novell GroupWise and also support for BMC's SQL Backtrack. 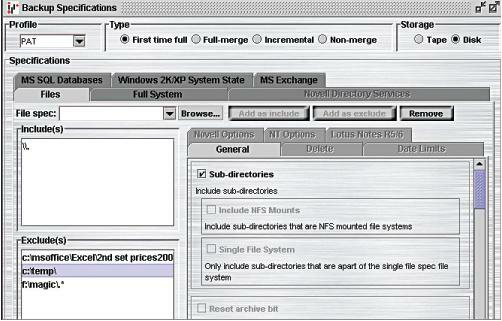 The restore process is also GUI driven. UPSTREAM Reservoir supports Windows stand alone restore with ASR. Some other features include silent installation, email event notification and automatic upgrade capability. New servers can be added automatically and disk and tape added dynamically to cater for growth. FDR/UPSTREAM can be used to backup VMware Virtual Machines. UPSTREAM is installed on a Windows server, either Physical or as a VM, and supports Full VM Backups, Incremental backups and will backup to Disk or Tape. UPSTREAM supports Change Block Tracking (CBT) for incremental backups, and can restore Full VMs either to the original or to a new VM. UPSTREAM can use the VMware vStorage API for Data Protection (VADP), which means it can use VMware snapshots to take a fast, consistent PIT backup of a VM, then copy the data off to disk or tape later. The UPSTREAM VMware backup administration is all performed from a web based Portal.